Turning everyday routines into more meaningful moments isn’t always easy, but it’s a sure way to live a more peaceful and relaxed life. Keeping up with the constant change of technology; however, doesn’t always allow us to stop and smell the literal, or even figurative, roses. The world around us is moving fast, and so often, we challenge ourselves — or follow the challenges of others — to move even faster. When I started at Jamf nearly three years ago, I was told that after about six months on the job I’d feel like my head was above water. Then, when the year mark rolled around, I’d feel like I reached the shore. If you’re a Jamf user, you know there’s a lot to know. And at Jamf, we don’t settle for mediocre. We strive to be great, because you, our customers, deserve it. As a non-technical employee, I have a unique role in the fact that instead of helping build the product, I discover interesting ways our customers are using it in their environments. Then I share their stories. In 2018, I had the pleasure of meeting some customers in Amsterdam. In a series of interviews, I learned how Rituals was changing their customers’ experiences with technology. The story of how they use iPad and iPod devices in their stores was so interesting, we even showcased them on the Jamf Nation User Conference (JNUC) stage. Ritual’s ICT Solutions Architect, Joost Van der Zwaan, joined me at JNUC to share how Rituals uses technology to create a 21st century shopping experience for their customers. What I heard, and what I saw while visiting their stores, was great. But then, during a recent trip to New York, I experienced it — not through the lens of Jamf, but as a customer. Though the mall location I visited on Long Island was smaller than the others, it effortlessly mirrored the organic beauty of their European stores. 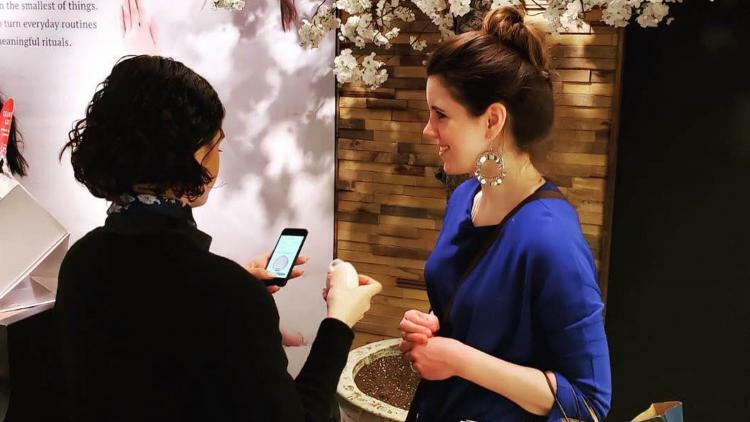 Its signature Cherry Blossom Tree and luscious scents created a calming environment to shop their extensive collection of luxury home and body products. Of course, it’s hard to fully leave work behind. Those who attended JNUC, or watched the video, saw my on-stage reveal of a score of 84 — not too bad. In New York, however, my score dropped to 82, showing a lack of skin moisture. Given our bitterly cold winter in Minnesota, I wasn’t shocked by the result. I spent the next several minutes picking out my favorite items (anything Ritual of Sakura) and checked out. After leaving, my friend commented, “I like that store. It isn’t like normal shopping. It’s more like an experience.” Did I go on to purchase far more things than I probably needed in the mall that day — of course. But it sure was a highlight to see one of our most innovative customers using Apple and Jamf to provide a small escape in an otherwise crowded shopping space. Rituals — I can’t wait to see what you’ll do next!